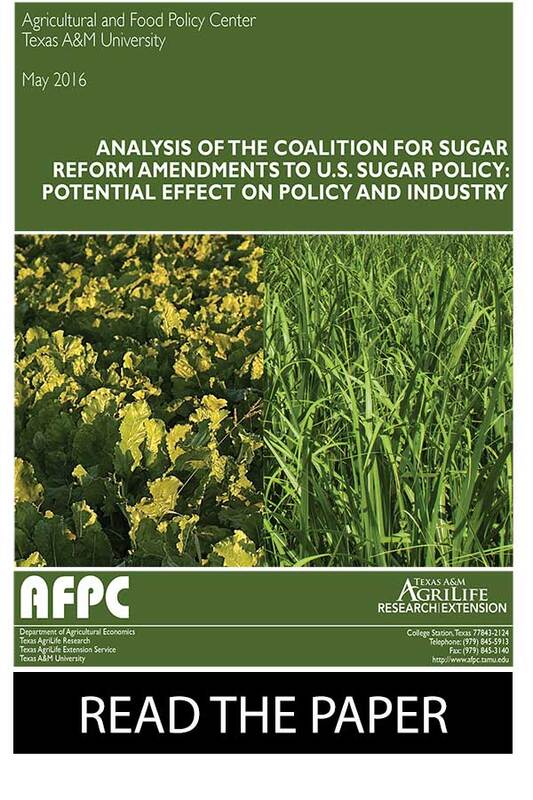 WASHINGTON – Current legislative proposals to change U.S. sugar policy may be positioned as modest reform, but they would have dire economic consequences on U.S. sugar producers, put U.S. taxpayers on the hook, and leave U.S. consumers dependent on unreliable, subsidized foreign suppliers, according to a new paper released today by two Texas A&M economists. The Coalition for Sugar Reform, an anti-farmer organization funded by large food manufacturers, has attempted to gut U.S. sugar policy for years in hopes of driving up profit margins for big confectioners and other sweetened product producers. Past lobbying efforts have included two separate proposals, one to unilaterally eliminate U.S. sugar policy and another to provide a $1.3 billion-per-year subsidy program. By proposing to weaken the safety net for U.S. sugar farmers to levels that were in place when more than half of American sugar processors closed, the result would be three- fold: (1) further injury to U.S. sugar farmers and processors at those times when they require a safety net and food manufacturers are already benefiting from low market prices for sugar; (2) further depressed prices received by producers, loan forfeitures, and U.S. taxpayer costs; and (3) ultimately, a substantial loss of U.S. sugar farmers and processors and, consequently, lower domestic sugar supplies and higher prices paid by food manufacturers, which they will pass on to consumers. The only policy gaps during that time occurred from 1975-76 and 1980-81 when U.S. sugar policy was not renewed. On both occasions, U.S. sugar prices skyrocketed and harmed consumers and food manufacturers, the authors explained, warning sugar policy opponents to be mindful of the past. PreviousPrevious post:What Goes Up Doesn’t Always Come DownNextNext post:World Price Volatility Continues. So Do Subsidies.